Pool Blankets are a great way reduce the running costs of your pool. Pool blankets come in variety of types, thicknesses and some also have heating properties. Adding a pool blanket to your pool can save you up to 50 000L of water per year in a average sized in ground pool. Pool blankets are also a great way to keep debris and leaves out of the pool, keeping your pool water, cleaner and healthier. While pool rollers are an option for pool blankets, it is highly recommended to use one unless you have a small pool or spa. Pool rollers make it easy to get your pool cover on and off the pool and make storage of your blanket easier. They also prolong the life of the pool blanket because there will be less drag on the pool coping when removing the pool blanket. Pool blankets and rollers come in a range of sizes to suit any pool. Contact us today on 1300 724132 for a great price on a pool blanket to suit your pool. We can install a pool blanket anywhere in Sydney providing the pool blanket is purchased from us. Installation of a pool blanket & roller will normally take 1- 2 hours. When ordered, pool blankets come rectangular and are generally sized in 300mm increments for example 8.2m x 4.2m. 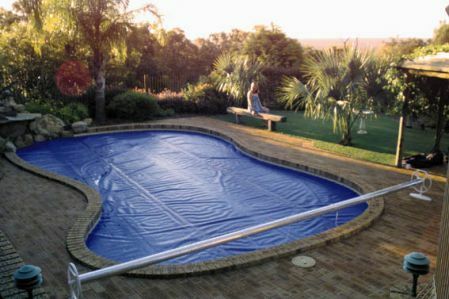 For fiberglass pools, we do have a range of pre-cut blankets based on sizes supplied by the major fiberglass pool manufacturers, these blankets virtually drop straight in the pool with little to no cutting required.